What is "The Promise?" Most people from Between the Rivers know of the promise. Even people outside of Between the Rivers, like in the towns of Murray and Cadiz, and others in the Kentucky area around LBL, know of the promise. So, until such a record or document shows up, all we can do is vet out the promise from secondary sources, such as other records, statements, and newspaper reports. Since we don't have an official document of the promise, it doesn't mean that we can't confirm just what the promise is. That is because the promise is embedded within the reasons and justifications for: 1) the necessity to take all the 172,500 acres for the LBL demonstration, and, 2) the reasons for tearing down all the existing businesses, towns, churches, farms, & buildings & dwellings. In a nutshell, the reasons given, were and are, that the land would be converted into a haven of nature in it's natural state. And that there would be no commercial business in the land, because it was meant to only economically benefit the surrounding areas outside of LBL. In other words, the people and the towns had to go, so that there would be no commercialization in LBL. So, this section of this website, known as "The Promise" is devoted to flushing out this promise from secondary sources. And as time goes on, I will be presenting many documents and testimonies, from anywhere I can find them, that confirms The Promise. This first section of the promise is an article by David Nickell that was submitted to Bill Lisowski, manager of the Forest Service in LBL, and to Congressman Ed Whitfield, for their response to his article, and then all three articles were printed in issue 8 - Summer 2000 - of the "Between the Rivers" magazine. These articles are use by permission of the authors, or are used under public use rights, or fair use laws. following article about the promise made to the former Between the Rivers residents. He provided copies of it to Bill Lisowski, the new LBL manager, and Congressman Whitfield and asked them to provide their perceptions on his article and the promise. They have graciously agreed. We have printed all three in hopes that you will find them informative. Casual readers of Between the Rivers magazine might be struck by all the old photos and stories about events from long ago. They might assume that this publication is driven entirely by nostalgia. They would be wrong, in my opinion. I believe this magazine was born out of concern for the future. We cannot preserve any hope for the future if we do not preserve our link to the past. It is our memory of a shared past that binds us both to others from Between the Rivers, and to the place itself. This is not a very profound insight, but it is so basic we might overlook it if we are not careful. We celebrate Memorial Day and Independence Day for the simple reason that if we do not foster our collective memory of how our country came to be and what sacrifices have been made to establish and preserve it, we will not long maintain our collective identity and sense of direction. The same is true with the Promise that was made when Land Between the Lakes was formed Between the Rivers. Without a cultivated memory of the Promise as the catalyst that gave rise to the LBL, how can we know in the future what the LBL is supposed to be? The formula is simple: How is identity preserved through change? By using memory of the past as the anchor. Without memory of the past, we cannot know which way is forward; there can be no integrity across time in the face of inevitable pressures that would result in something unrecognizable to those who founded and sacrificed (and were sacrificed) for the entity in question. How did the LBL come to exist Between the Rivers, and what is it supposed to be? What sacrifices were made to establish this relationship? A careful reader of this magazine will notice that each and every personal story and family history contained here is part of the answer to this basic question. All of the stories told here can be summed up in the Promise. It was not that difficult for the government to justify using eminent domain to force families from their homes when the dams were proposed. The rising water would provide all the justification needed – even though much taken land remained high and dry. But, in the case of the ridge remaining between the two reservoirs, it was not so easy to justify using eminent domain to take away the basic right of private property and to uproot families from a heritage as old and rich as the country itself. How could the government justify this afterthought that would drive over 900 families from their homes and farms to establish a recreation area – a play ground? The answer was that LBL was not to be another recreation area, but a demonstration of how protecting a public land from commercial development would benefit the entire region, with aesthetic, environmental, and even economic values. Government officials went to great lengths to explain this. They did it in testimony before Congress, in numerous speeches to local civic groups (many of which were reported widely in the press), in books written about LBL and its purposes, and they even explained it in our homes. TVA hired and trained representatives to visit each home Between the Rivers to explain what was about to happen and why. They were specifically told to promise that LBL would remain "forever free to the public and undeveloped commercially." The Promise even proved to be critical in the appellate court's ruling. The Sixth Circuit Court of Appeals ruled that because LBL was not to be just another recreation area, but a demonstration in how to manage public land to best benefit the surrounding region by protecting it from the economic forces that would otherwise result in its development, the government did have the right to use eminent domain against its citizens. Here is the point where all the family histories from Between the Rivers conjoin and merge to become not just our personal heritage, but the heritage of the LBL itself. This is not just about the past, but about the present and what direction the future should take. In short, without the Promise of no commercial development at LBL, there would be no LBL; there would be only two dams with private property, and developments on both sides of the resulting reservoirs. It is a simple fact: LBL would not exist without the Promise. The Promise lies at its core and ties our rich culture and heritage to it, even for those who desperately resisted the occupation of our homeland and bitterly resented how it was accomplished; even for those who never lived Between the Rivers and are now looking only for outdoor entertainment or economic opportunity. The promise binds us all, and the LBL itself, together. Now, there are those – and they are well positioned and influential, even if they are few – who insist the Promise was in the past and should no longer be taken seriously. But when did time limits, or convenience, become a criterion in whether or not to take promises seriously? Most of us know how to respond if someone were to tell us he or she will keep a promise, unless it becomes inconvenient to do so, or more profitable not to. We would not take such a promise seriously and would certainly not enter into any binding agreements on its basis. Which side of this moral divide will the Forest Service and the U.S. Government fall on? Many are the times that the U.S. Constitution has been inconvenient and it would have been much more popular, and even economically advantageous, to abandon it. But, even with all the changes, we can still call ourselves Americans only because we have tried to hold to the Constitution. It is the promise that has held our country intact. The same must be done if LBL is to remain recognizable. The same must be done if LBL is to maintain its connection to the heritage the Forest Service now says it will honor. That heritage includes veterans of the Revolutionary War, Civil War veterans (including an African American Congressional Medal of Honor recipient), Viet Nam veterans, and veterans of every conflict in between. The farms and homes they settled were later to be "sacrificed" so that the LBL might exist. This sacrifice was mandated in exchange for the Promise of no commercial development ever– in the LBL. If that promise is not honored the common bond between place, people and heritage is lost. LBL will become just another roadside attraction. Change at LBL is underway. There is no way around that fact. It is also a fact that only the Promise can maintain the complex relationship of people and place for the future. As decisions are made, it is critical that the Promise NOT be considered just another one of many options on the table. Convenience and economic pressures would then dictate another path that will lead to a future none of us would recognize. All options on the table should rather be considered in the light of how well they mesh with the Promise. Decisions about the course of our nation must be considered in light of the Constitution, rather than considering compliance with the Constitution as just another one of the options. For exactly the same reasons, the Promise that forged the often painful relationship between one of the richest cultural heritages in America and the LBL, must be the standard against which all options are judged. LBL was established to protect this beautiful place, with its rich heritage. We must never stop asking what it was being protected from. The answer lies in the Promise. Used by permission from David Nickell = email:	David Nickell. The following is a response to David Nickell's "The Promise" by Bill Lisowsky, Forestry Service Manager of LBL National Recreation Area. While it's obvious that Bill does not hold to "The Promise," but rather to the LBL Protection Act, we can't accuse him of reneging on The Promise. In the first place, Bill came into management not having to do with The Promise, and his mission from Congress is to adhere to the LBL Protection Act. No, it's not Bill that is playing this "shell and pea game" with The Promise. It is Congress and the President. TVA was an agent of Congress and the President, when they impounded the land, and therefore The Promise made by TVA comes "from the top." Let's not be fooled by this ruse. The Promise was made by our government, and no matter which agency manages LBL, the government is still bound to keep The Promise. First and foremost, I want to thank David Nickell and other former residents (as well as the dozens of other local residents and elected officials) for giving me a warm welcome to the area and spending time helping me to begin to understand the sacrifices that led to the establishment of Land Between The Lakes. It is obvious to me that LBL is a very special place that people care about deeply. David Nickell's passionate article is indeed helpful to me as I begin my work as Supervisor of LBL. It is important to me to learn as much as I can about the rich history of the area. I've been studying some of the books to which he refers in the article, in addition to background testimony, newspaper articles, court rulings and, of course, the Land Between The Lakes Protection Act of 1998 that established LBL as a Forest Service National Recreation Area. I have been asked if the Forest Service will honor the "promises" that led to the creation of LBL. Unfortunately, the record regarding what those promises were is fragmented and unclear. With as many people that were involved, and with sketchy written records, I can understand how differences of opinion occurred and remain unresolved. In reviewing the establishment record, I have begun to discern the intent. But what we have now to guide LBL's direction is the Protection Act. This law must be the basis for management at LBL. While I find excerpts in the Protection Act that are similar to words David chose for his article, given the early stage of my review and my need to develop an open dialogue with the public, I believe it is premature for me to make specific interpretations of the Act. I assume that some folks will read this and presume that I'm just being evasive. And in a way, they're right. I prefer to remain open to other information and viewpoints. The public needs to be involved from start to finish in resolving these complex questions. I hope to make clear that citizen input will be a cornerstone of management at LBL and relationships based on mutual trust and respect are very important to our future success. My motives for not providing more detailed answers are sincere; I would rather take that risk than rush to make assertions that imply otherwise. I can be more specific in answering the question of the "mission" of LBL, however, I believe Congress clearly dictated to the Forest Service what it intended in the Purposes (Sec. 503) and Emphases (Sec. 511 b.2.) sections of the LBL Protection Act. I won't repeat those sections here but in comparing these clauses with past testimony and legislation related to establishment and the initial LBL mission, I see great similarity. It is obvious these phrases were chosen very carefully – in some cases the words are exactly the same. But some variation exists too, and I can only assume that was by design. Included in the Protection Act are definitive statements such as "optimum yield of outdoor recreation and environmental education through multiple use management"; "research, test and demonstrate innovative programs and cost-effective management"; "help stimulate the development of the surrounding region and extend beneficial results as widely as practicable." I would say unequivocally that these and the other parts of the Protection Act are now legally binding "sideboards" that the Forest Service must follow and which comprise the bulk of LBL's mission statement. I welcome your comments about any facet of operation at Land Between The Lakes, in particular during the next few years as we together develop the new Land and Resource Management Plan. This plan will determine the strategic direction LBL will follow for the next ten to fifteen years and is based heavily on public input and involvement. I hope you will take the opportunity to get involved. The following is a response to David Nickell's "The Promise" by the Honorable Congressman Ed Whitfield. The folks from Between the Rivers owe the Congressman a huge debt of gratitude for stepping in and saving LBL from TVA's intended commercialization of LBL. Congressman Whitfield became close enough with the folks from Between the Rivers to know and understand how important The Promise was to those that sacrificed their land and way of life for the sake of the LBL National Recreation Area Demonstration. As a result , as this article will show, Congressman Whitfield understands The Promise. When the Chairman of TVA, Craven Crowell realized that he couldn't get his way and commercialize LBL, he became indignant, and tried to pull all funding for LBL. Some tell that, like a spurned child, he even started pulling the Porta-Potties from the campgrounds. This earned him the distrust of Congress, and strong ill well of the public. As a result, Congressman Whitfield worked to have management of LBL pulled from TVA and turned over to the Forestry Service. Congressman Whitfield explains the promise in unambiguous terms. Stating: "The Protection Act was intended to provide adequate federal funding for LBL and to codify in law the original mission and promise made to approximately 949 families who through eminent domain forfeited their homes, churches, businesses, and way of life in order that a National Recreation Area void of commercial development might be established." Congratulations to those who have contributed to yet another outstanding edition of Between the Rivers Magazine. Your dedication to preserving the oral and written history of Between the Rivers residents and their families is a testament to the heritage of those who gave so much in order that future generations of Americans might enjoy the beauty and tranquility of Land Between the Lakes National Recreation Area. My involvement with Land Between the Lakes began as your congressman six years ago when the Tennessee Valley Authority proposed concepts for commercial development in LBL to compensate for what TVA claimed was an uncertain future in federal funding of LBL. After listening to my constituents, many of whom were former residents of Between the Rivers, I called for a congressional hearing and it was held at Murray State University. Following my congressional hearing and several town hall meetings, the Tennessee Valley Authority withdrew its concepts for development. LBL faced yet another obstacle when TVA Chairman Craven Crowell declared TVA would no longer seek federal appropriations from Congress. He later recanted this statement, but TVA’s credibility in requesting federal appropriations for its non-power responsibilities had been diminished. I, along with Senator Mitch McConnell, introduced the LBL Protection Act to insure that our federal government's responsibility to protect and preserve Land Between the Lakes would be honored. The intent of the LBL Protection Act was to insure LBL's future as a National Recreation Area. The Protection Act was intended to provide adequate federal funding for LBL and to codify in law the original mission and promise made to approximately 949 families who through eminent domain forfeited their homes, churches, businesses, and way of life in order that a National Recreation Area void of commercial development might be established. Because of the sacrifices made by Between the Rivers residents, future generations of Americans will be able to hunt, fish, recreate and learn about the environment in this national treasure. I am confident that the LBL's new federal steward, the United States Forest Service, will strive to maintain the rich heritage of Land Between the Lakes while working hand in hand with the many individuals who love LBL. Used by permission from legal representative to Congressman Ed Whitfield, Jeff Miles. Summary/Conclusion: Though The Promise is not recorded in any document of record (that we can get our hands on), it is established by the reasons and justification for the necessity to take all 172,500 acres of land Between the Rivers, and also the same for the necessity to remove all businesses, homes, churches and buildings -- that there was to be no commercialization in LBL -- and that, when it came to economic gain and benefit it would go to all the surrounding businesses outside of LBL. Commercialism has crept into LBL. There is now a restaurant in Wranglers Camp, a store in Piney Camp, and concessions for drinks and ice in LBL. This is against the promise of no commercialization in LBL. Moreover, part of the mission of LBL, as promised at the time of impoundment, was that LBL would be a place of undisturbed nature, for educational purposes. If this is so, and it is, I'll prove it as time goes by, then why are they charging fees for at the nature center and Home Place? "The water makes the natural boundary, and we believe when people cross the bridges into the area they ought to be immediately conscious of the fact that this is a new kind of an area. That kind of a development is not consistent with continued inholdings and developments that become highly commercialized, and so on. There is room for the commercial developments on the opposite shores of Barkley and Kentucky Reservoirs, and we expect a multimillion dollar investment to result there. I can assure you we will be as considerate as we possibly can be of the individual problems of longtime residents in the area. I think, though if this project is to be successfully completed, and to make the contribution it can, not only to the region but the entire nation, it must ultimately be a unit. There cannot be inholdings." My thanks for this document go out to Nancy Proctor, a TVA research librarian at Knoxville Tennessee, who managed to dig it out of TVA archives, and was nice enough to send it to me. And to David Nickell for pointing out its existence. The following is an affidavit secured by David Nickell by a school teacher from Lyon County that took a job with TVA surveying in LBL. As you will read, she was instructed in a TVA orientation to tell the folks who were being forced to give up their land and way of life that: the area would remain forever free to the public and undeveloped commercially. During the early 60's when I was a teacher in the Lyon County School System, the Administration announced that TVA would employ some teachers for the summer for survey work. I obtained an application form from the School Board office and submitted it. I was subsequently given the job. Eva Lois Hackett and, I think, Aila Hayden were also employed from Lyon County. We attended an orientation session and were given maps showing the area we each were responsible for. My area was the Twin Lakes area. As I remember, we were to determine who and how many lived in each residence and give a general description of the property involved (mobile home, frame structure, etc.). Then we were to give the residents information about the plans for the area. The one thing that I remember distinctly that we were told to tell the people was that the area would remain forever free to the public and undeveloped commercially. A few months later, a charge was levied for the use of, I think, Hillman Ferry Campground. We interviewers and the residents felt at the time that this was a violation of the information that we had been given. When we protested, TVA's explanation was that they were not charging admission but merely charging for the use of installed facilities. After about three days of working in the area and encountering a mixture of hostility and courtesy, I realized that the job of interviewing people was not for me. The remaining portion of my area was then divided between the other two from Lyon County, resulting in more working hours for them. Subscribed and sworn to before me by Mary weldon Bale DuLaney on this 10th day of June, 1996. The following is from the Novemeber-December 1997 Issue of Audubon Magazine. The article is entitled: "Fading Promise," by John Daniel. It is a wonderful article on what the people from Between the Rivers went thru when TVA impounded the land. My thanks go out to David Nickell for providing a copy of this article, and to Cindy Clark at the Circulation Department of Murray State University. For the sake of keeping this article in its original presentation, I've provided it in Acrobat Reader (pdf) format. The following is from Betty Joe Wallace's "Land Between the Rivers" - History of the Land Between the Lakes. Here she documents the promise from newspaper accounts. Here she documents that in July, 13, 1963 TVA announced tentatively that there would be no lodging, restaurants, or resorts in LBL, and that the managed land would be protected. 17, 1963; Times, Huntsville, Alabama, July 17, 1963; News, Birmingham, Alabama, July 18, 1963. The newspaper account used "wilderness environment” and "recreational camping area" interchangeably. The following is from a newspaper account in a July 17th 1965 Evansville Courier article. It's a short article, but speaks of The Promise that: "Land Between the Lakes will be bereft of anything commercial." Visitors to this multi-million dollar recreation area can still buy supplies inside the park boundaries. Usually they go to Model, Tenn., about five miles from Rushing Creek camp area. A general store there still operates, but won’t after the end of 1967. Then visitors will have to bring in their own, or buy from businesses outside the area. Land Between the Lakes will be bereft of anything commercial. No stores, lodges, dining rooms, or motels will exist; and every home and existing business now in operation will be gone. For most people that is good news. The above article, was written by Ron Wormald, and published in the Evansville Courier on July 17,1965. THE PROMISE - SUMMARY COMMENTS: As can be clearly seen from Betty Joe Wallace's research, presented in her book, all existing commercial establishments that were located in LBL had to be removed so that LBL would be void of commercial development. For this, all the good folks that lived in LBL, and all their properties would have to go. These folks sacrificed their lands, towns, homes, churches, and businesses for this purpose. They were sacrificed for the good of our nation, it was claimed. We should always honor their sacrifice and make sure this Promise of no commercialization is kept in LBL. No compromises were allowed when they were forced off their land, and everything was torn down, and no compromises should be allowed today. After some confusion over the interpretation of the land and Water Conservation Fund of 1965, TVA had reached the decision that they would charge an entrance fee for IBL. TVA had proposed to charge a user's fee at some of the sites, but after due consideration it was decided that the fees would not be put into effect in 1966. It was expected that certain fees would be charged at locations which were primarily designed as an experiment in recreation, a well as wildlife and woodland conservation. Those campsites which had a user's fee charged travel and camping trailers with sanitary holding tanks one dollar and fifty cents par night. A campsite with electrical outlets designed for tents cost one dollar and twenty-five cents per night. Boat launching facilities cost fifty cents per day. Other sites without electrical facilities were available for one dollar per night. Now, if TVA demolished all the private businesses in LBL, so that there would be no commercialization in LBL, then what are THEY doing profiting off of commercialization? What? Did they act indifferent to private commercialization so that they could profit off of it. Did they want to eliminate the compitition? Seems they don't have the same indifference shown toward private profit and commercialization when it is they who are profiting. This should be a warning to us all. It reveals a hidden agenda that must have been held while they callously demolished all private property in LBL. 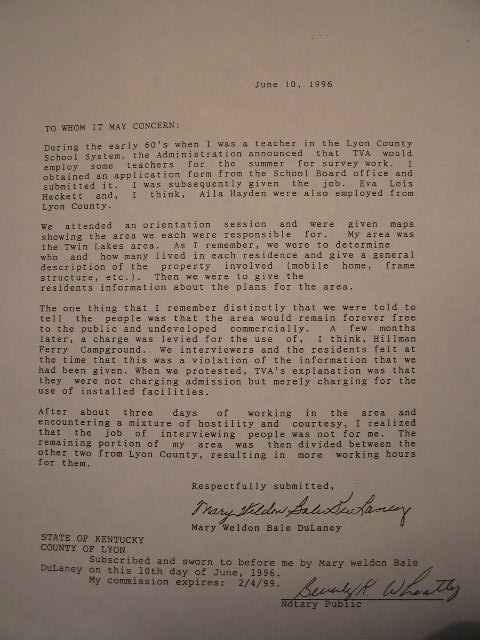 Aubrey J. Wagner, Mr TVA, lied to congress and to the public. He wanted all commercialization out so that TVA could profit from it. TVA took the land from people that could have profited off of business in LBL, so that TVA could corner the market for themselves. If this is not a warning that keeps us on our toes, I don't know what is. That's why we should always keep a watch on the government, and what it is doing in LBL. They have hidden plans to one day, when all the folks that once lived in LBL, and were driven off of their land, are dead, they can commercialize LBL. In the middle 1990's, they thought that they had waited long enough, so they introduced their Five Concepts, which were plans to bring full-blown commercialization into LBL; theme parks and all; condo's and all. But they didn't wait long enough, they jumped the gun a little to early, and there were enough people still alive to submit 30,000 signatures to put a stop to it. This resulted in TVA being thrown out of LBL, and the Forestry Service brought in. But those hidden plans are still there.